Is anyone looking for one of these? Tandems found for sale. "This is a very fun 2 person bike made my Cignal Melbourne Express. It is in good condition and will turn heads when cycling down the street with a friend. Two person bikes are pretty rare and Charleston is the perfect city to own one. Contact me if you are interested, thanks!" Have a double or a triple on demand! This bike can either be a triple or a tandem. So it is both depending on what you want. If you are a bike whiz - you can quickly go from double to triple. As you can see in the video below. It comes with all the parts, and longer chain to go to the triple. We have loved this bike - it was a birthday present for me so we could ride longer distances with our kids, we biked to school and even took it with us on vacations. Because of the way it comes apart we could fit it inside our van. The bike also grows as you kids grow which is genius. But now our kids now ride their own bikes often faster and farther than I can. We do still use it but not enough to justify keeping it. These are very hard to find, I could not find one for sale anywhere. Bike Friday does not make the triple anymore but they do still work with them and will help you with any issues or customizations you may need. New they ran about $3700+. The photo show it set as triple and tandem- currently ours is set up as the tandem (that is our against the wooden garage doors). The original Family Tandem was designed by Cofounder Alan Scholz to be a family heirloom bike -- a sturdy, reliable tandem that can be handed down from generation to generation. The Family Tandem Triple Traveler sports adjustability, allowing it to be set up as a tandem for two adults or an adult and a child or as a triple. Kids and other stokers feel at home closer to the ground, and the small wheels make it easier to handle for the Captain. 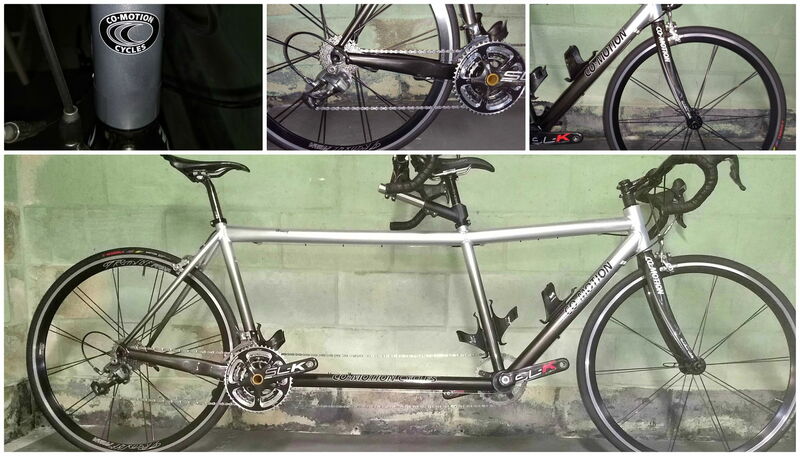 The Family Tandem can adjust as a child grows. The beauty of Bike Friday tandems shines in the ride, which is enhanced by 20 inch wheels and easy step over tube. The Family Tandem does not fold, but can be disassembled easily to fit into two Samsonite Travel Cases for easy airline travel. We also could easily remove the front stem to get it to fit into our van to transport as a tandem. Additions included : Pedal extenders, we started our daughter very young so we opted for pedal extenders so she could initially reach the pedals at 6 years old. Different front stem: we are both tall and needed more clearance so Bike Friday made us a custom stem to give us more space -- but we have both stems. The people at Bike Friday are wonderful. Computer: VDO, and two spare tires. We used this video to go from tandem to triple. Old and quaint frame design. Interesting sight on the local CL today, three tandems visible onscreen at the same time. Don't see this every day. The Cannondale is priced at $1800. This would be a great starter, or more, for someone at only $600. Looks ready to go cross country! I am not connected to seller in any way. I have two twin Schwinn 10 speed tandems for sale. Would be great for a family. Father, son and Mother daughter. Price is $300 take your pick or $500 for both. ...and the usual slate of 27" Burleys and Santanas dying on the vine, which I guess will soon be joined by V-brake 26ers. It would be cheap af to get onto a tandem around here right now. I have this idea you could run a business rebuilding 27" Suntour tandems into 700c Shimano bikes, but I guess the price wouldn't be something anyone wanted to pay. Last edited by Darth Lefty; 06-07-17 at 10:43 AM. Think of it as a "sociable," one of those side-by-side tandems. Surrey bicycle made for two pedallers and two kids in the front basket. Seat and removable canopy in fine condition. Needs new tire tubes. Made in Italy. Sirenetta. Beach bike. Seems like a reasonable price; these are awfully nice. Special needs Buddy Bike for parent and child. Sport model, 27 speed Deore hub, anodized silver aluminum frame, dual leg kickstand, EZ Sunray bike seat with backrest for child, fold-out foot pegs for child to rest feet or they can pedal along with parent. Raleigh tandem bike. top of the line for tandems. it was $1,500 new. '80s Claud Butler tandem. I've seen this one in person and there's a lot to like if you're after a C&V two-seater. The Arai drag brake would sell for half of that asking price....or more. Someday spring will come, be ready. Beautiful high end Schwinn Paramount tandem. Original color was red. Phil wood hubs. If you would like more details, please contact me. Thanks for looking. We will be at the ETR in Williamsburg VA in June and would be happy to bring the bike with us. Please let us know. We are picking up a new Calfee Dragonfly this weekend. UPDATE: Sold it to a local couple. They are first timers. Got 1500 miles on the new Calfee Dragonfly. Awesome bike - 27 pounds (saddles, cages, pedals, computer mount). Clear coat - no point. Interesting to see what people consider "Good Condition". Seems meaningless. Vintage Peugeot Tandem. 54cm captain/50cm stoker. 5speed. Rear drum brake. Rides beautiful. I can add pedals if needed. Kind of rough, but definitely antique-y and tandem-y. Last edited by thumpism; 06-14-18 at 06:41 AM. Purchased from the original owner. Only ridden a handful of times. Shifts and rides smoothly. Has new tires. Size is Medium/Small or 18/16. Just clearing space and trying to scrounge up some money for another upcoming purchase.